The Ohio State men’s volleyball team (8-16, 3-7 MIVA) dominated the entire match on Saturday night, as the Buckeyes’ hot offense continued their strong production and swept Quincy (5-18, 0-10 MIVA), 25-12, 25-17, 25-20. Having lost its past two games, Ohio State needed a win like this to build momentum as the team moves forward, and it came against Quincy, who was missing a key player in junior outside hitter Omari Wheeler. Ohio State senior setter Sanil Thomas and redshirt sophomore outside hitter Jake Hanes led the offense to the sweep. Thomas ran the offense with 36 assists, giving Hanes the opportunities that he turned into 12 kills. Ohio State head coach Pete Hanson liked what he saw on the court and said this sweep will be very good for team morale. The Buckeyes started off getting out to an early 3-0 lead in the first set and never looked back. 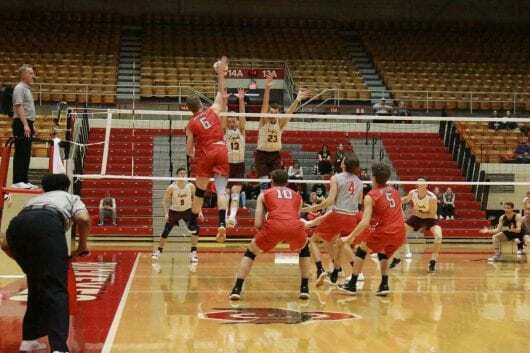 Ohio State was led by sophomore outside hitter Martin Lallemand, who recorded .two kills set up by Thomas to begin the game, giving the rest of the team momentum that was never relinquished. Lallemand finished the night with six kills and seven digs. The second set saw the Hawks jump out to a quick lead, but almost immediately, Ohio State took back the lead and extended it to 12-4 to effectively take control of the set. Redshirt senior middle blocker Blake Leeson was key for the Buckeyes in this stretch, getting three kills and two aces during that stretch. Leeson finished the night with nine kills, two aces and one dig. Hanson had nothing but good things to say about Leeson’s performance in the second set. After controlling the first two sets with ease, Ohio State began to slow down in the third set. Quincy saw some great play from senior setter Adam Rogan, who had eight assists, and sophomore outside hitter Brendan Estrada, who added five kills. It was not enough though, as the Buckeyes managed to hang on to get the narrow victory and clinch the sweep. Rogan finished the game with 23 assists and five digs, while Estrada led the team in kills with 10 along with four digs. WIth the momentum from a straight-set win, Hanson is focused on what his team can control. Ohio State goes on the road and faces Loyola Chicago at 7 p.m. Friday.